Skelton, R. A. Cabot, John. Dictionary of Canadian Biography online. University of Toronto Press. 1979–2016. A short introduction; it has been updated based on material published related to The Cabot Project at the University of Bristol. Maura, Juan Francisco. “El mito de “John Cabot”: construcción británica para reclamar la soberanía de Norteamérica” Cuadernos Hispanoamericanos. 788 (2016): 4–25. (Available on line). ^ 1.0 1.1 1.2 1.3 Catholic Encyclopedia "John & Sebastian Cabot" (HTML). newadvent. 2007 [2008-05-17]. ^ 2.0 2.1 2.2 Skelton, R.A. Cabot, John. (编) Brown, George Williams. Dictionary of Canadian Biography. I (1000–1700) online. University of Toronto Press. 1979 . ^ SCHEDA TECNICA DOCUMENTARIO "CABOTO": I CABOTO E IL NUOVO MONDO (PDF) (新闻稿). （原始内容 (PDF)存档于2011-02-23） （意大利语）. (TECHNICAL DOCUMENTARY "CABOTO": I and Catalan origins have been proved to be without foundation. ^ 7.0 7.1 7.2 Pedro de Ayala letter 1498 to the Spanish Crown. The Smugglers' City. Department of Historical Studies, University of Bristol. [20 February 2011]. ^ Derek Croxton. The Cabot Dilemma: John Cabot's 1497 Voyage & the Limits of Historiography. University of Virginia. 2007 [17 May 2008]. （原始内容存档于2007年3月17日）. ^ 20.0 20.1 , Francesco Guidi Bruscoli, 'John Cabot and his Italian Financiers', Historical Research (Published online, April 2012). ^ Skelton, R.A. Cabot, Sebastian. (编) Brown, George Williams. Dictionary of Canadian Biography. I (1000–1700) online. University of Toronto Press. 1979 . ^ 24.0 24.1 Evan T. Jones, "Alwyn Ruddock: John Cabot and the Discovery of America", Historical Research, 2007, pp. 237–40. ^ 26.0 26.1 26.2 26.3 26.4 26.5 "John Day letter to the Lord Grand Admiral, Winter 1497/8", The Smugglers' City, Dept. of History, University of Bristol. 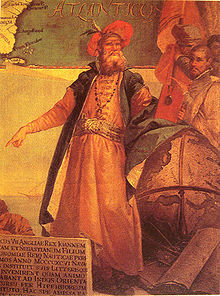 ^ John Cabot was not Bristol's only explorer. Bristol Post. 28 August 2009 [13 September 2016]. （原始内容存档于2015年9月8日）. ^ Evan T. Jones, 'Bristol, Cabot and the New Found Land, 1496–1500' in P.E. Pope and S. Lewis-Simpson (eds. ), Exploring Atlantic Transitions: Archaeologies of Permanence and Transience in New Found Lands[永久失效連結] (Boydell and Brewer, 2013), pp. 29–30. ^ 40.0 40.1 Evan T. Jones (2008), "Alwyn Ruddock: John Cabot and the Discovery of America ", first published online 5 April 2007, Historical Research, Volume 81, Issue 212, May 2008, pp. 242–49. ^ di Alberto Magnaghi. CABOTO, Giovanni e Sebastiano in "Enciclopedia Italiana". Treccani.it. [2017-03-06]. ^ Cutler, Miriam. Buenos Aires Street Guide. LibrosEnRed. 2011: 16. ISBN 9781597546539. ^ Giovanni Caboto Club History 互联网档案馆的存檔，存档日期2009-08-17.